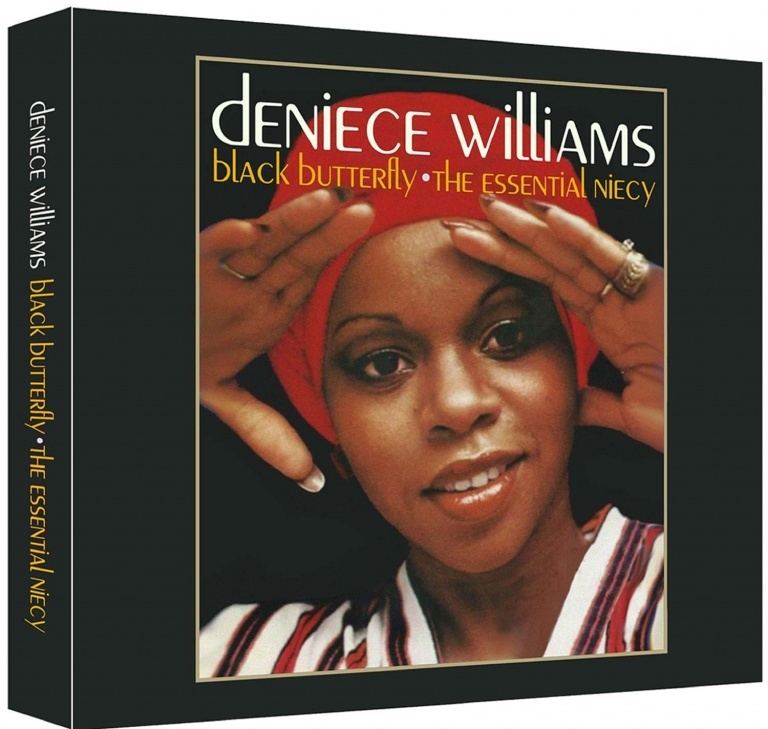 • Deniece Williams was one of the most popular soul artists of the seventies and eighties. BLACK BUTTERFLY – THE ESSENTIAL NIECY is her first ever 2CD complete career retrospective, featuring all 27 of her Billboard R&B hit singles and classic album tracks. As well as an interview with the lady herself, the album includes a foreword written by her occasional duet partner, the legendary Johnny Mathis. • Deniece was born in Gary, Indiana and after releasing some singles on Chicago labels, became Stevie Wonder’s backing singer and a member of Wonderlove. After a performance in 1976, Earth, Wind & Fire’s Maurice White offered her a contract as a songwriter for Kalimba Productions and convinced her to re-launch her own recording career. • Her Columbia debut album, THIS IS NIECY was produced by White and Charles Stepney. Its first single was a huge success. ‘Free’ penned by Williams and Susaye Greene reached #2 R&B, #25 Pop and topped the UK singles chart in 1977. ‘That’s What Friends Are For’ followed it into the UK top ten at #8. Her next album SONG BIRD was produced by White, after the death of Stepney. It spun off the hit ‘Baby, Baby My Love’s All For You’ (R&B #13/UK #32) and the gospel-toned ‘God Is Amazing’ which began Williams’ continuing career as an Inspirational artist. • 1978 saw Deniece pair up with Johnny Mathis for the massive international hit ‘Too Much, Too Little, Too Late’ (R&B #1/Pop #1/UK #3) as well as a duet album with him. The following year brought her a #1 Disco hit with ‘I’ve Got the Next Dance’ (R&B #26/Pop #73), and she scored hits in the early eighties with ‘What Two Can Do’ (R&B #17), ‘Silly’ (R&B #11/Pop #53) and ‘It’s Gonna Take A Miracle’ (R&B #1/Pop #10), all produced by Thom Bell and Deniece, as well as the George Duke produced ‘Do What You Feel’ (R&B #9). Her duet with Mathis on ‘Without Us’ became the theme of popular sitcom “Family Ties” starring Michael J. Fox. • Williams was asked to perform a song for the “Footloose” soundtrack in 1984. The movie starring Kevin Bacon became a box-office smash, as did the soundtrack album. The Duke-produced ‘Let’s Hear It For The Boy’ (R&B #1/Pop #1/UK #2) became the biggest pop hit of her career. She continued recording for Columbia until 1988, rounding out the decade with another couple of big hits; the Steve Levine produced ‘Never Say Never’ (R&B #6) and ‘I Can’t Wait’ (R&B #8/Pop #66) which saw her back with George Duke. • Big Break Records proudly presents BLACK BUTTERFLY – THE ESSENTIAL NIECY, which includes all of her chart hit singles from 1976-1989. Newly remastered with rare single mixes and presented in a deluxe digipak complete with a 24-page booklet and detailed liner notes. This collection is a must for all Soul, Pop, Gospel and Disco fans everywhere!